A thing or two to cheer about the present crop of economy management team sprouted from the comments of the Minister of Finance, Mrs. Kemi Adeosun, in Washinton DC, United States of America, USA, on the sidelines of the World Bank -IMF meetings. Commenting on suggestions that the deal by the members of the Organisation of Petroleum Exporting Countries, (OPEC), would be the catalyst for the nation’s exit from recession, Adeosun said strategic planning and implementation would rather, be the catalyst. This gives hope that the economy managers may not, after all, be sitting-by, waiting for oil prices to rebound when most observers, including the government (past and present) have come to the conclusion that the bane of the nation’s economy is its overdependence on oil revenue. We dare say that even at below 2017 budget benchmark price of USD42.5 per barrel, the economy had no business sliding into recession if the right policies were in place and executed diligently. Now that the oil price has stabilized significantly above the benchmark, no thought should be entertained in the direction of hinging growth on oil revenue. However, we believe that the government should walk the talk of the Minister. We noted all the smooth talks in the Economic Recovery and Growth Plan, (ERGP), with the medium term growth projection of about 7.0 per cent by 2020, but we can only give the government a chance to prove its capacity to deliver results now that all it needs in terms of resources is with it. Not totally dismissing the impact of the OPEC deal which excluded Nigeria from the production cut back while ensuring price stability, we expect to see action in the direction of diversification of the economic base. A worrisome signal of throwing money at problem is already showing in the foreign exchange market where the Central Bank of Nigeria, CBN, is fighting speculators over exchange rate with the apex bank pumping in foreign currency as the key strategy for keeping price and exchange rate stable. We believe the apex bank decided to do this because of the positive development in the oil price and production level which boosted the external reserves in the past six months. This approach is a no-brainer. The danger we see here is a possible spill over to other government actions where availability of cash would be driving policy initiatives to address any perceived difficulty. We therefore warn, in line with Adeosun’s position, that rather than deploy cash, government’s actions should be geared towards engendering confidence in the investors, both domestic and foreign, to bring the needed resources to stimulate the economy out of recession and achieve a private sector driven growth and development. 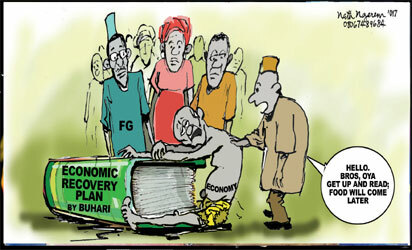 The post Economy: Exiting recession without oil money appeared first on Vanguard News.